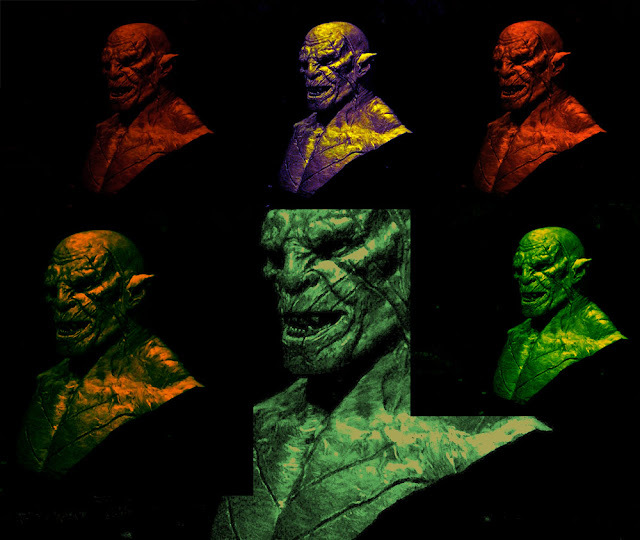 three votes for "Find your way" and nine for "Azog". 12 people voted, which we are thankful of. 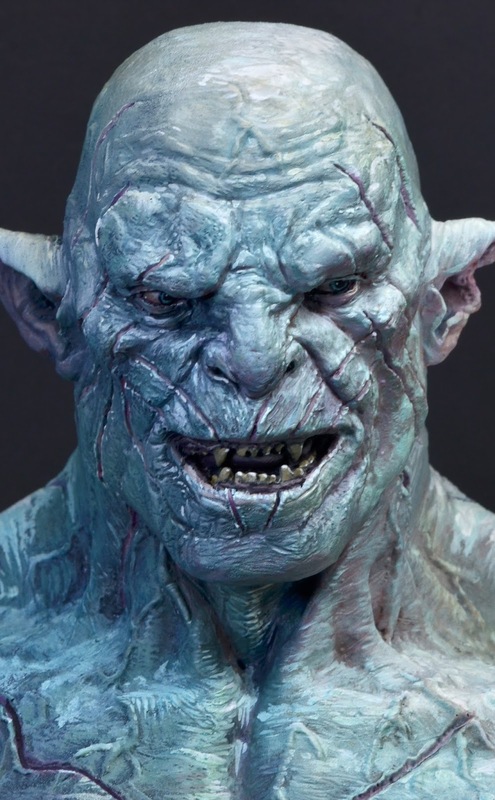 So finally Azog managed to win and his article will drop in with this posting. 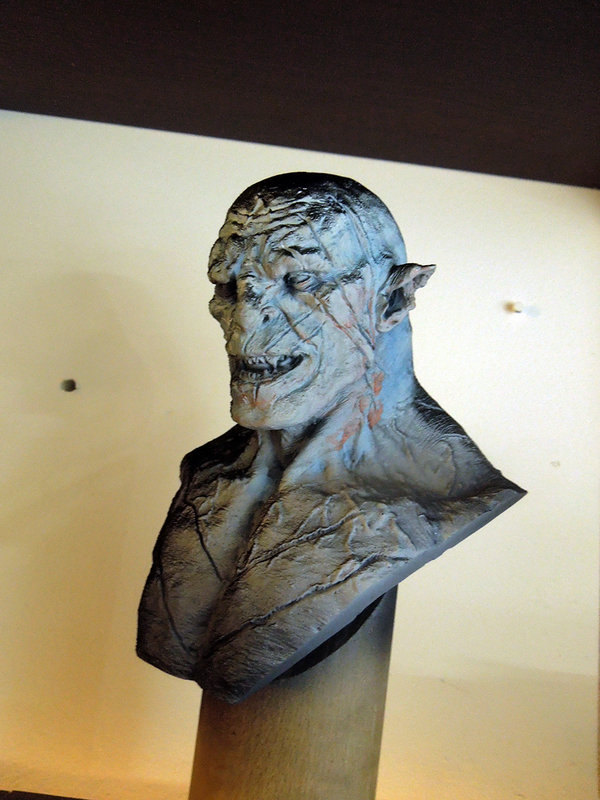 This bust is sculpted by Cyril Roqulaine from France. 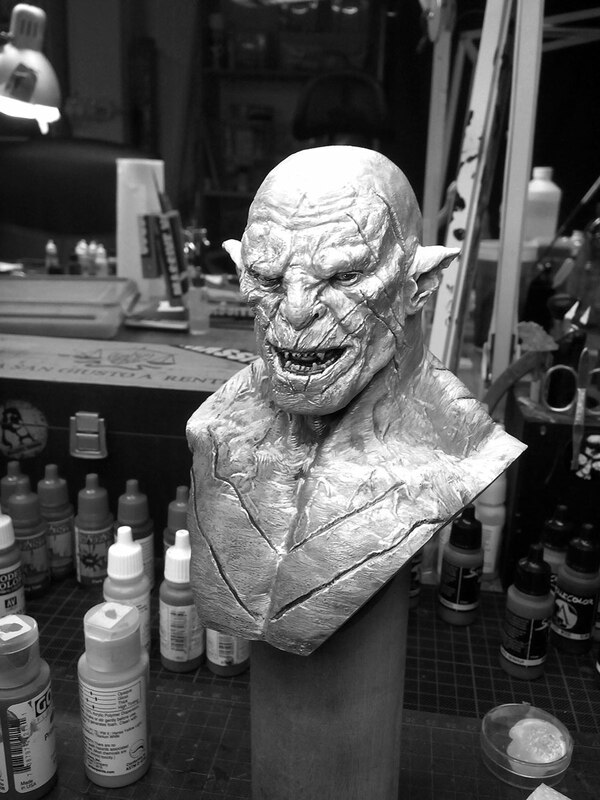 It is a huge bust and brutal sculpt. Heavy too. Brutal because you can feel the sculptors energies and powers in the volume and with this also very beautiful. It is not on public sale, but you can contact the sculptor via his facebook page to get more information on this bust. 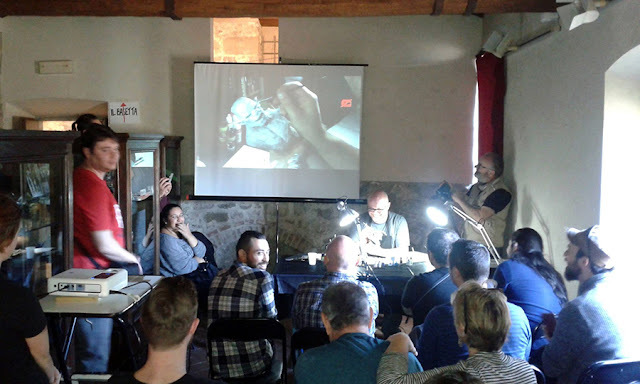 Roman was invited for demonstrational painting instructions to last years Monte San Savino Show 2015, where he decided to take this beast for a one hour explanation of his wet in wet color sketching method. A common way he uses to start his projects. 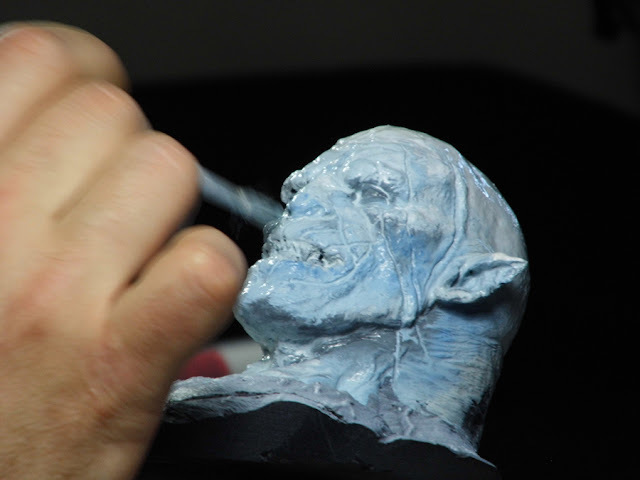 Having a close look on Azog. No plans for painting yet. Big and heavy piece, no attached to a big plinth for taking it to Monte. Primed black and white. Ready for the trip to Italy. Sadly Roman's time for demonstration painting in Monte was more like thirty minutes instead one hour due classes ahead of his and the midday break when the castle closes, but nonetheless all who joined deserve a thank you from Roman as we had great fun. The demonstration part in Monte was mainly about bravery, losing fear of color and the wet in wet sketch to get into the paintjob, to find a way into the project. 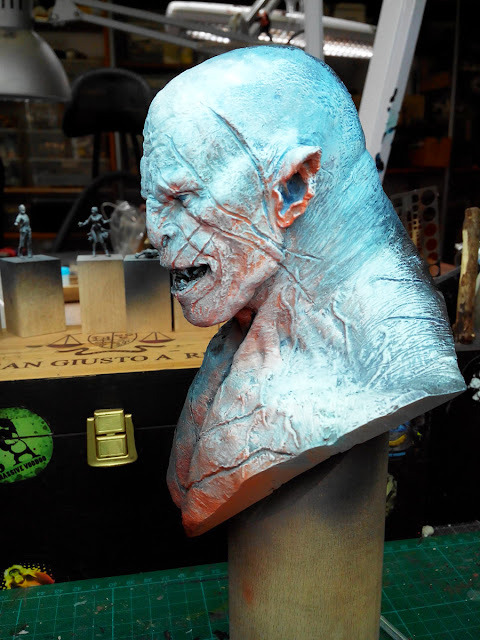 Roman wanted to show that there is no need of being scared of colors, that there is nothing you can do wrong or can not be repaired during the process. It is a common thing that on the one hand many love miniature painting, but on the other hand are never happy with what they do, because they fear what others think or say about their work. Roman enjoys to start really rough and wet, yeah. Levent did a full video of the demonstration done in Monte, check it out here to get to know what happened there last year. Many thanks, Levent. 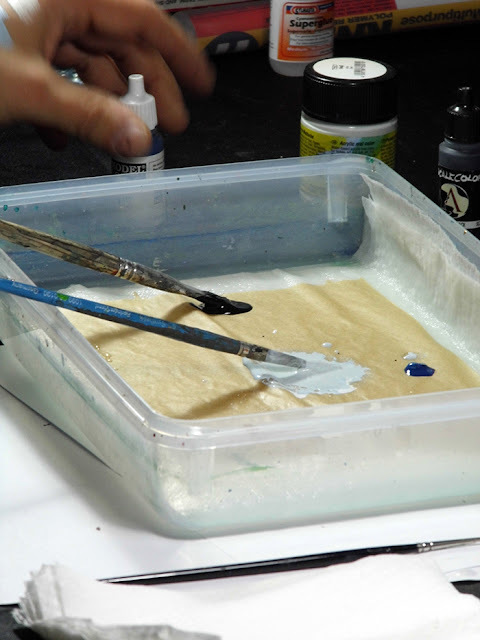 How can you find self-confidence while painting your models? Trust in what you can do, think about what you can not, train yourself, don't put yourself under too hard pressure from the outer world. It is you and color, no one else. 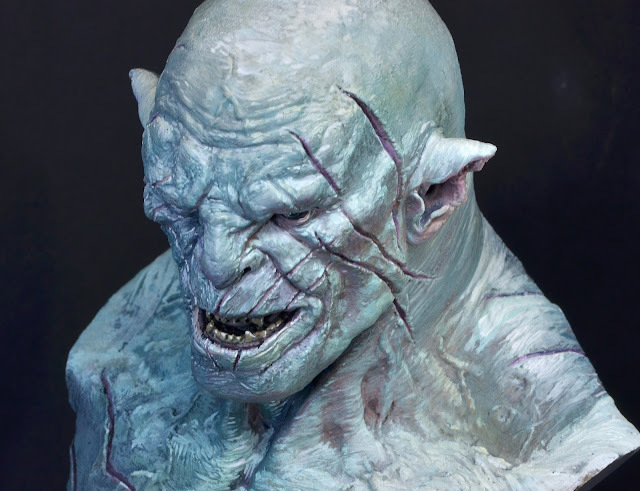 Roman will now guide you through his thoughts and progress on Azog from the point on he came home from Monte San Savino. 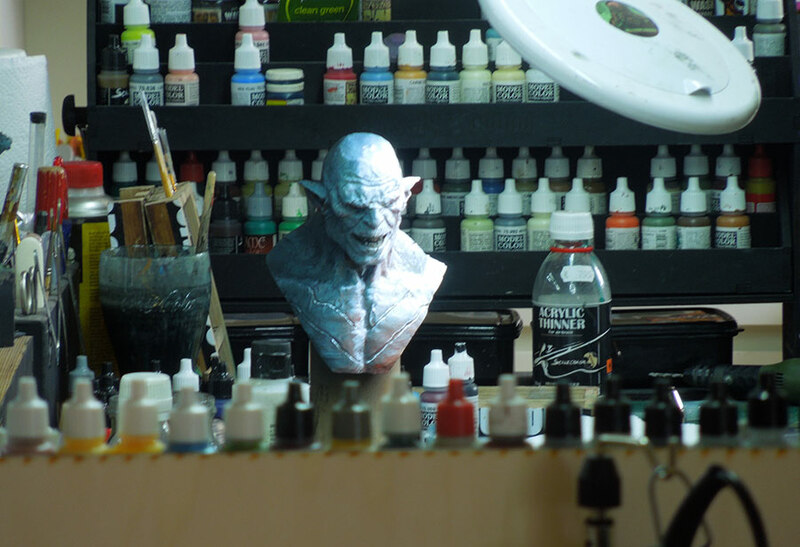 He will try to tell you the insight to this paintjob, but also wants to focus on showing you methods how you can train your self-confident painting. 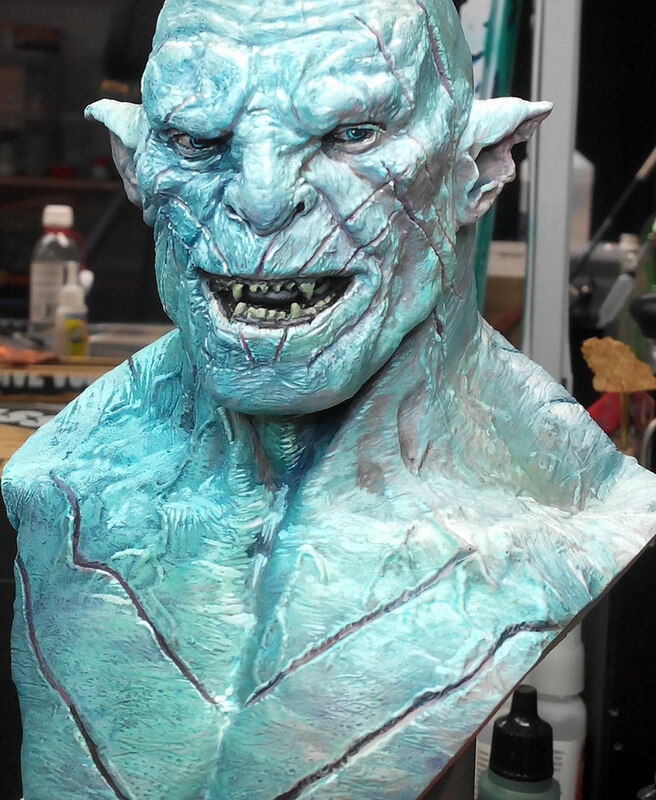 This is how Roman brought home Azog. About thirty minutes of demopainting and now look at this mess. Is it a mess? Yes, absolutely, but there it is: It's a thirty minute sketch on a superhuge bust, what to expect? 1. What is it that you don't like at the moment? 2. What is distracting you? Confusing you while looking at your work? 3. What do you want to change? 4. Why do you want to change it? 5. How do you change it? You can ask yourself these questions through all stages of a project. No matter if it is a diorama, a single miniature, a tank or a bust. It doesn't matter. Ask yourself. Of course you can also ask your friends, you can ask in a forum, you can ask your cat, but in the end it is important that from all these inputs you definatly also asked yourself. You questioning what you do is the most important question. The answers you find with your thoughts the most important ones. The ones from your friends and pets can influance your thoughts, but never should influance your way too hard to not paint your way anymore. 1. 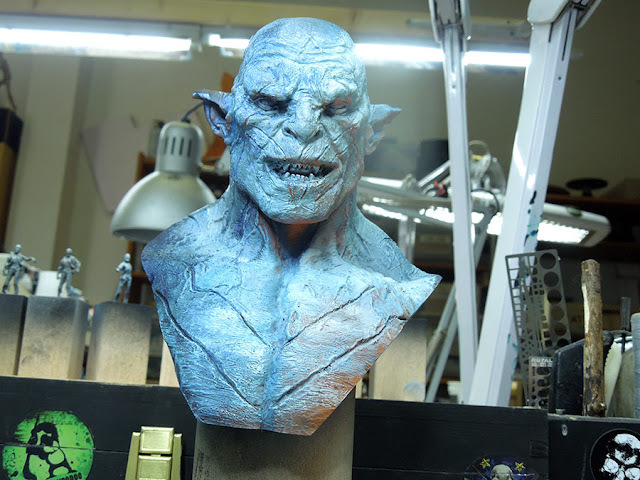 That it is still a very early WIP and a lot more time has to be put in to make it look good. 2. The color choice is good, the idea of the bounce light fine, but now all needs more defination. Definition in contrast on all those shapes and volumes, to make them easier to read for the person who is looking at this bust in the end. 3. 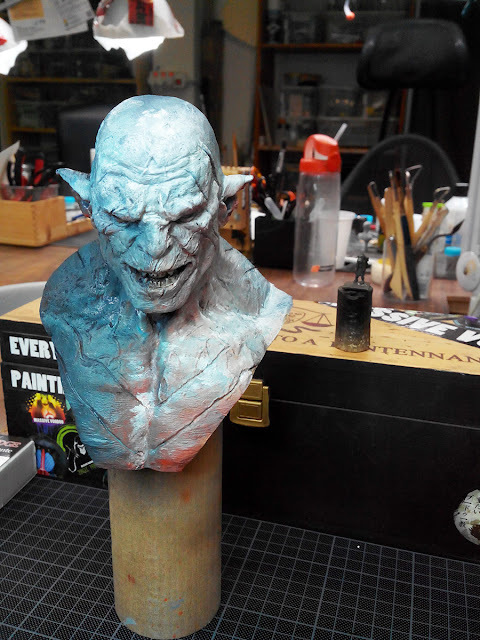 I want to change: Put some time in the volume work, shadows and highlights, on the way there clean up areas, maybe paint the eyes to finish to see the character staring at me for motivation. ... we all know how this can end up. This guy was just too huge and Roman had by far more important stuff to do than sitting down and working on this beast of a bust. 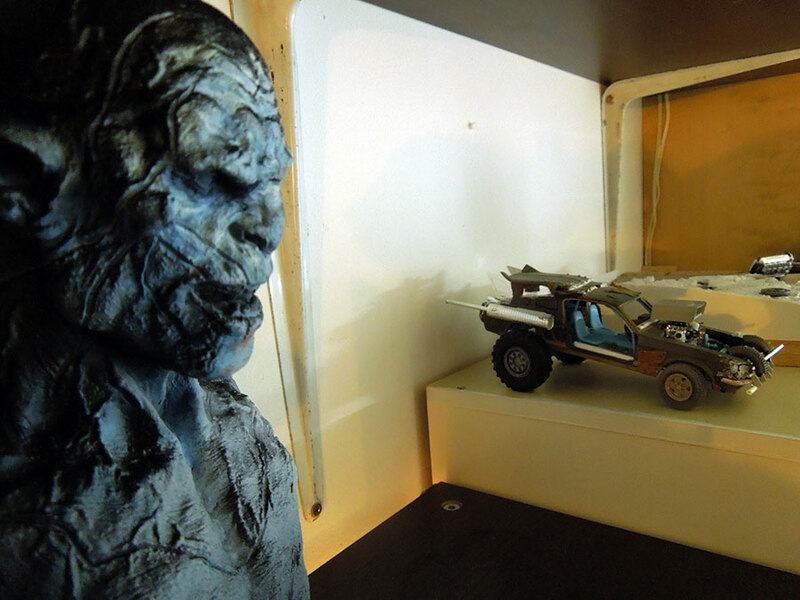 So for the first two months after Monte Azog was hiding in a cabinet. That is ok and fine, if you do not put yourself under too much pressure. When Roman returned to Azog he made up his mind and as he told himself in the example above, more contrast is needed to make all the volumes understandable. He was too lazy to do this with a brush and carefull. Why not sketch on? Roman took black primer spray and controversly to the sketched OSL light he sprayed pure black. Pft! Pft! Pft! In need of contrast on a large scale, why not go large without fear? Uogh, well, I somehow miss color in it. The black sketch helps me to understand what is going on in the sketch but still focus on smaller areas is needed, but I do not push myself to it as still in the overall picture I do miss the color. So work on this first. Airbrush. Pft. Pft. Blues and Oranges. If you don't have an airbrush use a brush for it. Works also good, change what you want to change without fear of results and tools and paint brands. This is the way to learn for yourself. 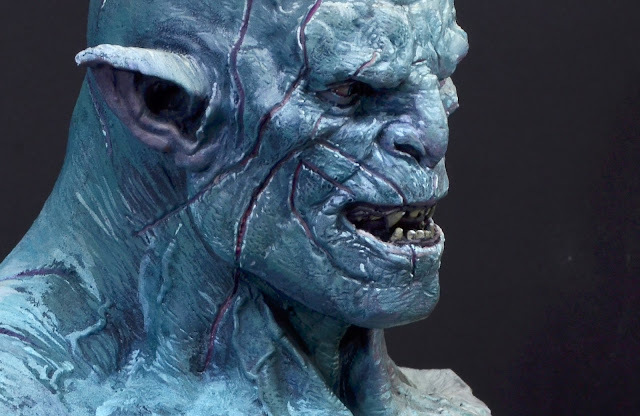 Well, he is not white and Azog in the movie is a white Orc. Now he looks like an Orc from the Clan of Complementary Color Hues. I want to bring back my whites. 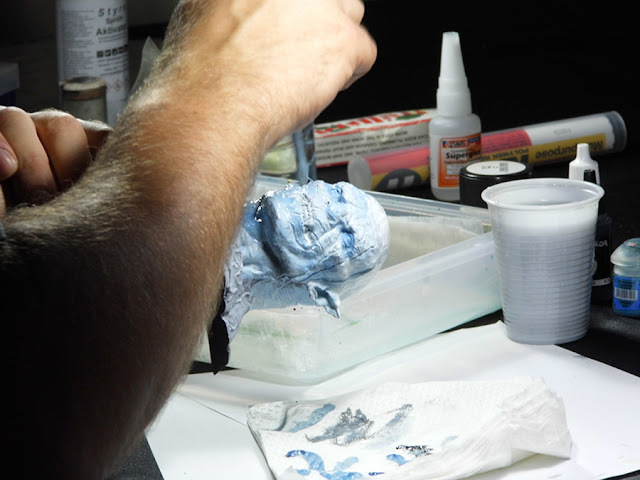 I really like the shadow from the black primer but I want to include this much smoother in overall paintwork. Brushwork. Well, you can even go with your tool of choice here, some would do with the airbrush others with fingers on such a big bust. Change what you want to change without fear of results and tools and paint brands. This is the way to learn for yourself. Blueish Whites slapped back in place, but still all that was done from the sketch is still there and visible. More white!! Bam! Bam! Bam! Contrast is slowly coming in, but mainly in the overall bust. Needs detail work. I like the bright site already the one in the shadow is just muddy blackbluesomethingblah. Need to work on this too. I also want to make the orange reddish parts less powerful again, still visible, but less powerful. 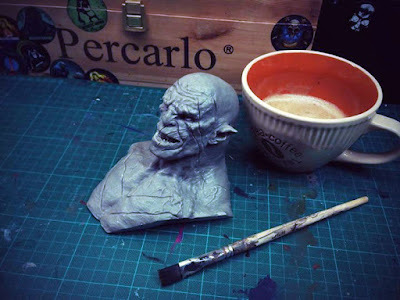 I don't like to work with too small brushes on such a big bust. Also the scars, wounds need attention. Brushwork. I will sit down and paint from surface to surface. To blend them together. That means I need middletones for too rough transitions. Really need to work on the blue areas with this technique and put some time in it. 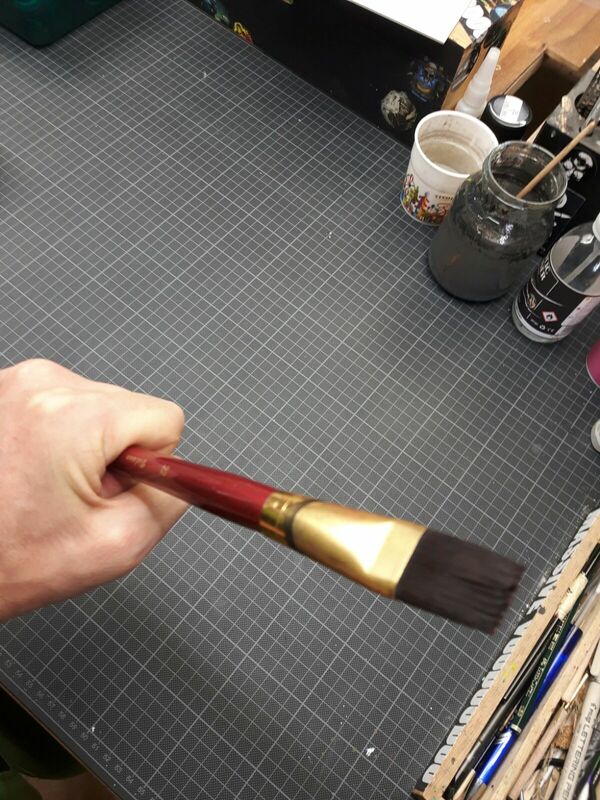 Using a bigger brush. Paint the wounds/scars. Bigger Brush. Check. Size 22. This photo from the far - while Roman was picking up a coffee - was inspirational. 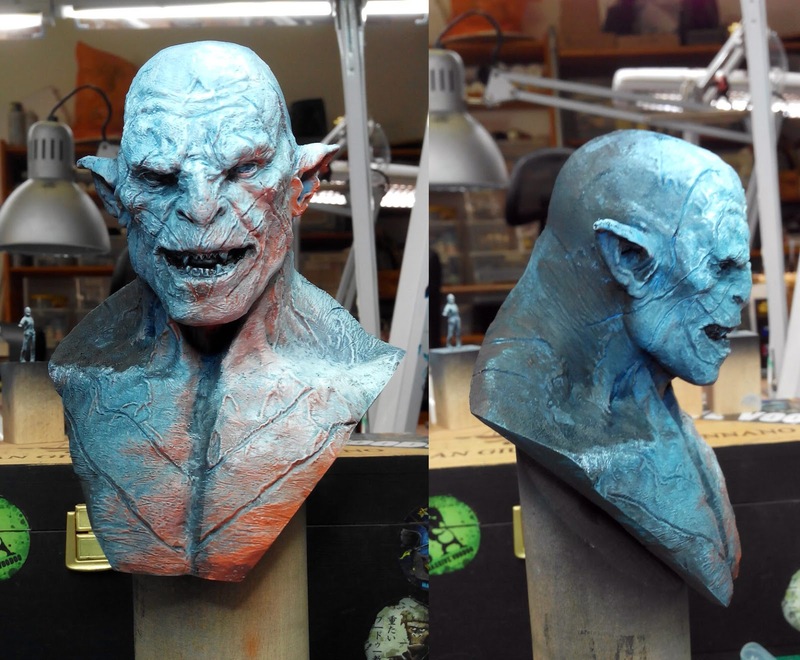 Important sidenote: Do not always look at your models from too close, also check back if they work from the far, especially if they are such a big canvas for your color work and light and shadow play. whites have been increased. Details have been worked on smaller volumes, oranges have been taken behind layers of blueish whites, the blue side has been included in the main picture, but darker as the brigher side should be more in focus for the viewer. Eyes were painted. A lot of the large areas were covered with whites and even rather thick colors, using the big brush. Smaller lines and "details" were done with smaller brushes of course. This photo is definatly too blueish. Dark and bright contrast check via black and white photo. Well, actually I am quite happy. Ok I see many areas that could be blended more smoothly, but I decide not do to so. I want to keep a connection from the Cyril's paintwork to my brushstrokes. A brutal paintjob. I enjoy the way I slapped up color there with the big brush. Maybe I put him aside and have a look later on if there are tiny areas I completly missed out in my painting frenzy. Maybe. Well, keep it calm and call it a day. 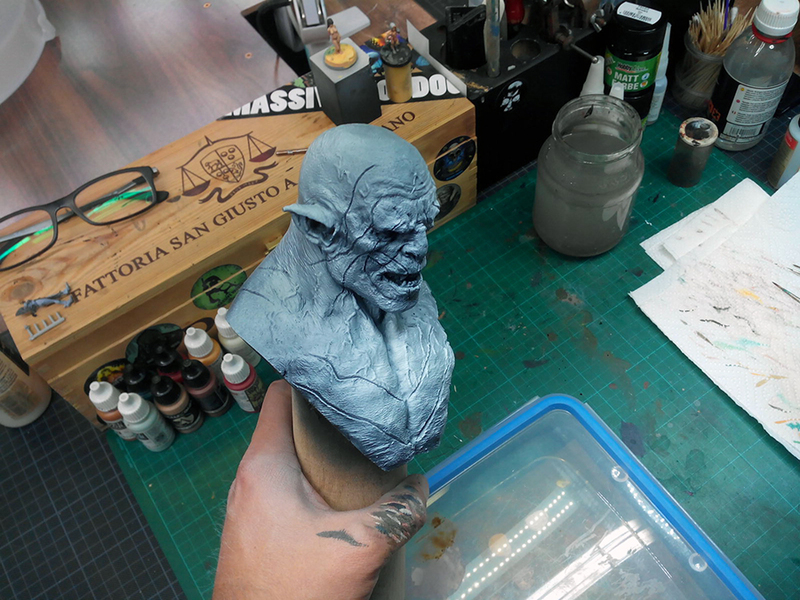 Look back on the model in the next couple of days when the mood is right and spent some two more hours on some details you like to change or work on. Two hours, with alarm set. 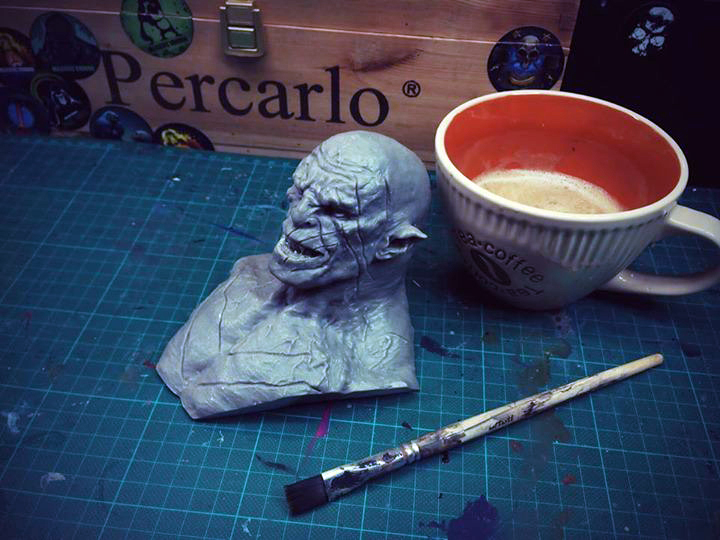 As I already am happy with it and I do not want to change the brutal look of the paintjob by working to hard to get it smooth. Final photos of Azog, the white Orc. 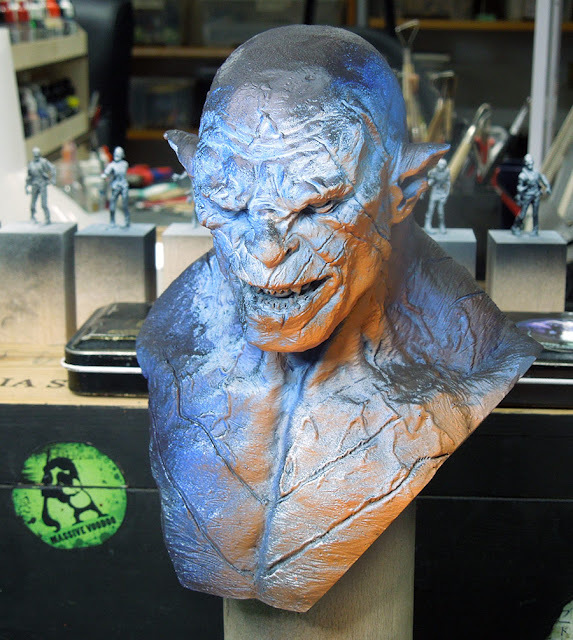 More photos of Azog on Putty & Paint. Paint self-confident. Do not fear. Always think what you want to do and do it. If you are unhappy with the look of something make your thoughts about it. Ask yourself why you are unhappy. If you do not find the answer right away, think about it until you find it. Speak with friends, share your thoughts and ideas and find your way. Paint self-confident and decide for yourself when you are done with your goal. What is the worst case that can result from this? 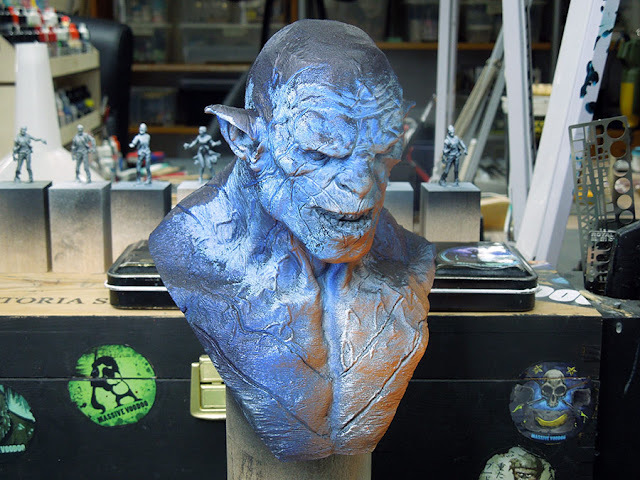 Yes, something can fail and you learn and you overpaint it or redo it, but you've learned your lesson and your set of painting tools is bigger for the future. 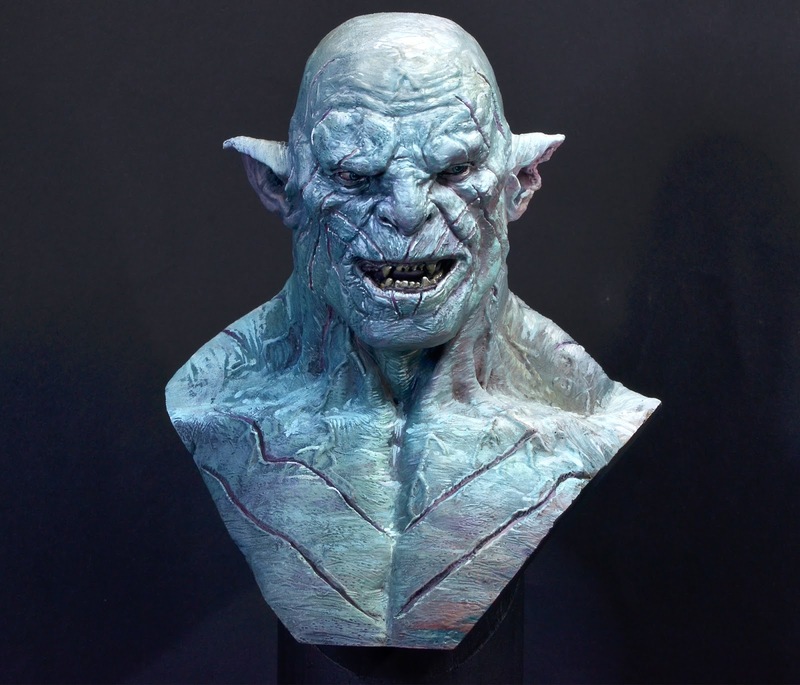 Roman took Azog from the studio to his cabinet at home and as he is too large for the transport box Roman carries this guy in hand and did put him in a shoe in Erik's trunk. 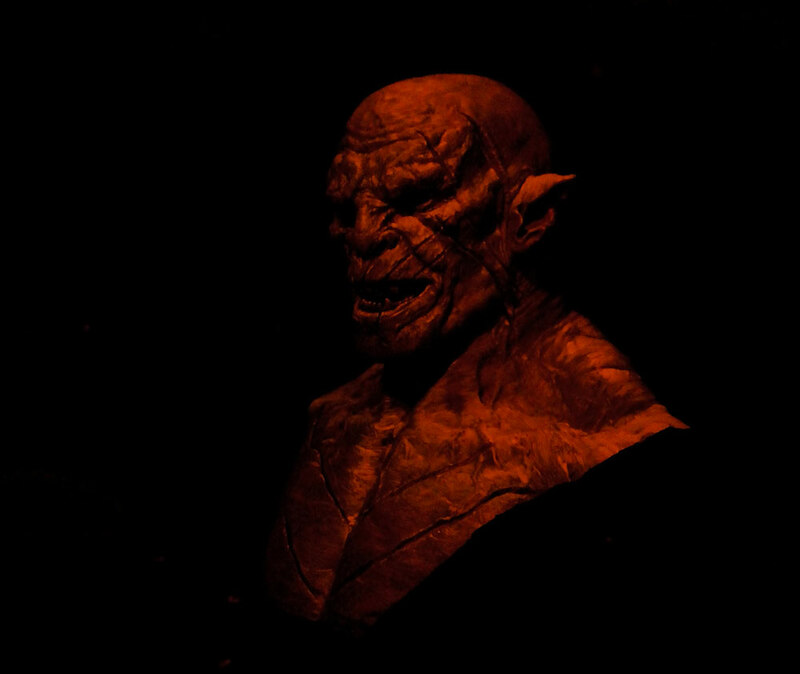 While we prepared the ride, Azog was standing on the car roof by night, lid by orange lamps of the houses. It looked so cool that we had to take a photo. And the mind starts racing, why didn't Roman go with a different color choice? So many options. Well, even these thoughts see no need to touch your self-confidence in a bad way. It was done in the way Roman wanted it to do and the inspiration came too late. He is happy with his version and you can be pretty sure that there is some other painter outthere who might do another version - his version - of this bust. Paint self-confident. Most important: paint! Lovely stuff. I really like the black and White photo to have a look at the contrast.